As I have discussed in a previous posting, public awareness regarding the importance of conservation and time-shifting electricity use away from peak demand times is absolutely essential. 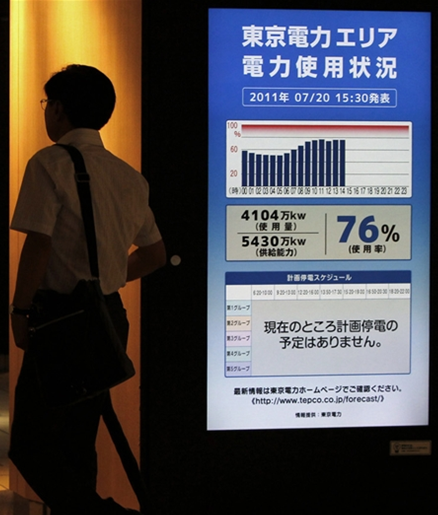 Japan has done a great job of that after having to shut down most of their nuclear plants which represented 28% of electricity supply before the Fukushima plant disaster. Prominent public displays of real-time electricity usage, “weather report” style current usage reports and forecasts on the TV news and requests to curtail power-hungry operations announced over company inter-com systems all help to keep the need for conservation and reduced peak demand high on the public agenda. A recently released study by J.D. powers confirms the relationship between stronger customer engagement and overall customer satisfaction. The study found that customers who were participating in any utility-sponsored program scored about 10% higher on a customer satisfaction survey than those who were not aware that these programs existed. And these are not exciting programs; paperless billing, in-home energy audits and rebates on Energy Star appliances were the big hitters. What would happen if utilities offered their customers programs that could reduce their monthly bills in a meaningful way? Oklahoma Gas & Electric (OG&E) has done just that and the result was another #1 rating for OG&E amongst large utilities in the southern region. The actual number earned by OG&E, 683 on a 1,000 point scale, is the highest amongst large utilities in the entire U.S.
What is really encouraging about the OG&E result is the way they achieved it. A quote from their press release summarizes their customer-centric approach which is making increasing use of both the most advanced real-time energy monitoring technology and social media. The OG&E website is filled with material that is appealing and informative. For example, the graphic below provides a simple and effective summary of how the “Smart Hours” program works. The company web site also offers games and activities that allow customers to earn points, win tickets to sporting events and other incentives for “spreading the word” about OG&E programs such as their voluntary wind power purchase program. By providing “cool zones” to help vulnerable members of the public avoid heat-related illnesses and offering many high-profile public education programs OG&E continues to build broad community support for conservation and sustainable energy initiatives. At the heart of any demand response program whether it be strictly on a “good citizen” basis or whether it involves financial incentives is the ability to understand residential electricity use on an hourly basis. That requires smart meters. Unfortunately, “smart meters” have received a lot of bad press based upon highly questionable allegations of potential health risks and invasions of privacy. As a result it is absolutely necessary to address customer concerns during the rollout of any smart meter program. A comprehensive study by the Smartgrid Consumer Collaborative (SGCC) in 2011 investigated about 150 smart grid initiatives in an attempt to identify consistent success factors. As might be expected, the reputation and public trust earned by a utility has a significant bearing on the willingness of customers to engage in smart meter and demand response programs. Engagement for utilities starts with their own employees and there is evidence that tapping into the energy and enthusiasm of employees and local celebrities can have a big impact. The SGCC study quote from the Arizona Power Corporation (APS) demonstrates that public education can be creative – maybe even fun! So what is the bottom line? I would conclude that if a community is mobilized, provided with engaging and easily understood information, and understands the long-term benefits of reducing peak demand, significant changes in consumer electricity consumption patterns can be achieved. When you think about it we only have a real problem with insufficient electricity supply for a few hours of the day on the hottest days and the coldest, darkest nights. If we can successfully clip these demand peaks we can avoid having to build additional firm generation capacity that is used only sporatically. And as we move into an era when “Availability-of-Supply” pricing will replace “Time-of-Use” pricing the ability to quickly change system load in response to variable renewable energy sources like wind will become increasingly important. How Much Battery Storage is Enough for Roof-Top Solar Panels? Anyone that has read some of my blog postings is probably sick and tired of me beating the drum for energy storage. To paraphrase John Lennon’s aunt Mimi as quoted in Philip Norman’s book “Shout” – “Energy Storage is all very well but I don’t want it for breakfast, dinner and tea”. Just to make things clear I do realize that there are more important things in my life than energy storage. The well-being of my family, the health of planet earth and, of course, world peace. Having said that I am convinced that energy storage is at least as important as the latest Hollywood wardrobe malfunction – and look at how much exposure those things get! What I thought would be very useful is an on-line tool that can calculate the amount of solar panels and associated battery storage that would be required to get partially or completely off the grid. I wanted this to account for the expected solar insolation received at any point on earth for any given day. Such a tool would allow someone contemplating installation of solar panels to try different scenarios and see which one produced the optimal energy management solution for their particular situation. I looked around on the web and found a few tools but none that really did what I wanted (if someone knows of a tool please send me the URL). So I decided to build one. I didn’t think it would be easy but I didn’t quite understand the complexities involved. The first thing I wanted to do was calculate the amount of insolation being received at an arbitrary location. I graduated with a degree in Geophysics and early in my career I published a number of scientific papers. For the most part big, hairy equations do not scare me … much. But when I looked at the spherical geometry equations used to accurately calculate solar insolation I was quickly ready to pack up my marbles and go home. This game didn’t look like it was going to be that much fun. The solar panel is assumed to be installed at the optimal tilt to provide the maximum solar power output averaged over a year. See Charles Landau’s site for a complete discussion of this topic which is not as straightforward as you might expect. It is easy to change the tilt angle in order to investigate the impacts on a particular day. The calculations assume a clear, perfectly sunny day with no passing clouds. The calculations assume continuous clear line of sight to the solar panels from sunrise to sunset. In most urban settings this is unrealistic because of nearby trees, utility poles, buildings, or hills. I decided that the best way to confirm that the calculations were working reasonably well was to determine sunrise and sunset by the first and last minutes when the equations generated insolation. I chose March 21 as my test date which I assumed would have 12 hour days and nights and peak insolation at 12:00 noon. That’s when I found out how little I know about the basic interractions of this planet and the sun. It turns out that our days are always a bit longer than a theoretical calculation would determine because of refraction of sunlight and the fact the sun is not a point but a disc. As a result daylight lasts about 6 minutes longer at the equator and upwards of 20 minutes longer near the poles. As a result my first light/last light approach matches the theoretical calculations on the PVEducation site but does not quite match the “actual” sunrise and sunset times available from sites such as the NOAA Sunrise/Sunset calculator. I plan on including a correction based upon a simple curve fitting exercise which does a pretty good job of estimating the extended daylight with the only input variable being lattitude. It also turns out that days are not exactly 24 hours in length but vary slightly in length throughout the year according to the “Equation of Time”. Luckily for me the PSA function handles that. Once I was able to generate reasonable hourly insolation values for any place on earth the next step was to set up a mathematical “smart microgrid”. As depicted in the graphic above there are some decisions that have to be made and these have been coded into my on-line tool. If there is spare power available from the solar panels after satisfying the current load in the house then it can be used to charge the battery. If the battery is fully charged (or if there is no battery) then the power can be sold into the grid. If there is not enough power available from the solar panels to satisfy the current load in the house then power can be drawn from the battery and failing that (or if there is no battery) power can be purchased from the grid. 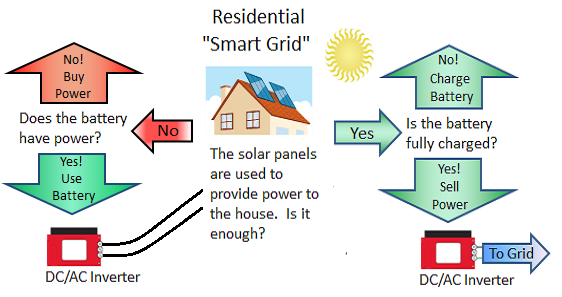 The ebbs and flows of electricity between the household load, battery, and grid will depend upon the solar power available, the load pattern, and the capacity of the battery (if one has been installed). The load pattern can be set in the tool by choosing a peak demand value and a load profile which will implement a predefined residential usage pattern. However, most people will feel that the predefined usage pattern is not really applicable to them. In order to handle that it is possible to enter an hourly load pattern either taken from smart meter readings or estimated in some other way. Note that load patterns will probably vary a great deal between winter and summer. I plan to add additional load profiles and allow for the storage of user-defined load profiles in a future release of the calculator. The tool presents two sets of hourly calculations side by side with the default values being for June 21 and December 21 which will represent the best/worst cases for solar power production. This also allows for easy comparison of two tilt angles or azimuth angles. So that’s it. Hopefully these tools, like the many other excellent tools already available from PVEducation.org will be valuable as people try and learn more about how roof-top solar panels and a residential smart microgrid can used in combination to achieve a measure of energy independence. At the end of the day these calculators are no better than the theoretical assumptions and mathematical equations they are based upon. So I would encourage you to give them a try and see if they match any real-world results you might have access to. I would be keen to hear from you – send email to toolsfeedback@debarel.com. Hawaiian Electric Company’s Integrated Resource Plan – Welcome to Fantasy Island! On June 28, 2013 the Hawaiian Electric Company (HECO) released its Integrated Resource Plan (IRP) which outlines how it will meet electricity demand over the next five years and how it will achieve the Renewable Portfolio Standards (RPS) which require that 25% of generation be from renewables by 2020 and 40% by 2030. This 775 page document consists of hundreds of graphs and tables from different runs of a computer modeling tool called the “Strategist”. There are also some very superficial statements about the potential for Demand Response, conservation, integration of more renewable generation and inter-island cable connections. When I see computer model scenarios with names like “Blazing a Bold Frontier”, “Stuck in the Middle”, “No Burning Desire”, and “Moved By Passion” I immediately think back to a consulting engagement in the oil patch that I was part of many years ago. After our initial meeting with the client, which involved about 15 people for the whole day, our sales guy was ecstatic because we had accomplished two things; we agreed upon a name for the engagement (which he had proposed to the group in the first 5 minutes of the meeting) and we agreed upon a two sentence mission statement. I thought it was a ludicrous waste of everyone’s time but I was wrong. That incredibly “productive” meeting sealed the deal for an equally “productive” sale of 30,000 hours of consulting to the client with no deliverables, no schedule, and no guarantee as to the quality or qualifications of the consultants they would get. For some reason I think there was a very similar meeting at the HECO offices a year or two ago. What I find conspicuously absent from the HECO IRP is something called common sense. In other words, the IRP relies principally upon a computer modeling tool to generate answers rather than applying human logic to analyze reasonable alternatives. In my experience with complex models used in the oil and gas industry this is not a winning strategy. One notable aspect of these charts is the large discrepancy between the Nameplate capacity and actual generation. The Geothermal facility on the Big Island represents only 6% of nameplate capacity and yet it generated 21% of the total renewable electricity during the year. The reason? Geothermal is reliable. In fact the Puna facility had a utilization rate of 80%. The same situation applies to the large waste-to-energy plant on Oahu which incinerates most of the solid waste generated on Hawaii’s most populous Island and outputs up to 90 MW of electricity. 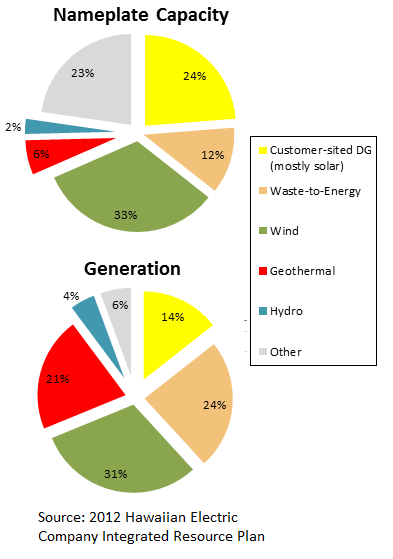 Wind energy generation is roughly equal to its proportion of nameplate capacity. That sounds promising until you consider that about 50% of that production takes place at night in periods of low demand. There are also frequent periods of relative calm so that relying upon wind is simply not feasible. So from both physical infrastructure and economic fairness perspectives a continuation of the current pace of PV installations does not appear to be sustainable in my opinion. Geothermal on the Big Island can and should increase to become the main source of electricity there. That is great for the Big Island but there is no comparable Geothermal resource potential on the other Islands. As noted, the charts above also highlight the significant contribution of the waste-to-energy plant on Oahu. However, the 2012 upgrade to this facility resulted in the vast majority of Oahu’s solid waste being treated. There simply is no more waste to use in this type of facility. Hydro, although it has a relatively high utilization rate, has been mostly developed so that there is very limited potential for further increases in generation from that source. The big “Other” category in the charts consists primarily of a single large bio-diesel plant (the Campbell Industrial Park Generation Station) which is run rarely as a peaking plant. The cost of the biodiesel fuel is too high to justify continuous operation and as a result the plant had a utilization rate of only 2% in 2012. The only other renewable mentioned prominently in the IRP is wind and that is problematic for many reasons. Not only is it an unreliable source but it is very highly variable with wind changing intensity and direction frequently and dramatically. The small, isolated grids in Hawaii would be very difficult to stabilize if large amounts of wind generation were incorporated. The IRP also states that the best wind resources are on the smaller Islands such as Lanai while the major load center is Honolulu. The cost to lay submarine transmission cables between the Islands is very substantial. All things considered the HECO IRP does not present anything close to a realistic plan to move Hawaii away from burning residual fuel oil to generate electricity. The “Strategist” computer model is obviously good at generating many graphs and tables of data. Whether any of the output really makes sense is another question. I have spent a considerable amount of time looking at different scenarios for the Hawaiian Islands and proposed a different approach in a blog posting with the title “Hawaii Renewables facing Cross-currents and Headwinds”. I believe that Concentrated Solar Power plants with Thermal Energy Storage represent the best option for the state. I have traveled to Hawaii many times and love every part of the state that I have had the pleasure to visit. I would like to see Hawaiian dependence upon hydro-carbons reduced or eliminated as quickly as possible. 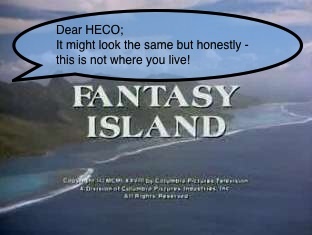 There are realistic options available to HECO. They just need to understand that they are on an island in the Pacific Ocean – not in that other place.